A good flat iron can be a girl’s best friend. Having long, wavy hair and living in Florida, it is crucial that I use the right flat iron in order to have silky smooth hair without the damage that can be caused by other styling tools. I have purchased three flat irons in the past two years and was disappointed in either the results or the fact that the equipment stopped working after a short period of time, not only damaging my hair but ultimately costing me money to keep replacing it with a new one. Therefore, I knew that it was time to find a professional quality flat iron that would give consistent results and last longer while using the latest technology. That is when I discovered Barbar which provides “superior, durable and eco-friendly” hair products. I couldn’t wait to try out a flat iron from the Barbar product line. It can be used on wet or dry hair with burning or damaging hair. I have long highlighted blond hair so I was too apprehensive to try it on wet hair but I did use it on my freshly blow dried hair. I was elated with the results because even on a very humid day in Florida my straightened hair actually stayed straight for the entire afternoon while we were out on bike ride (this never happens!). I don’t have a lot of time to spend on my hair so I love that this flat iron heated up very quickly and it required only one pass through a section of my hair in order to straighten it. 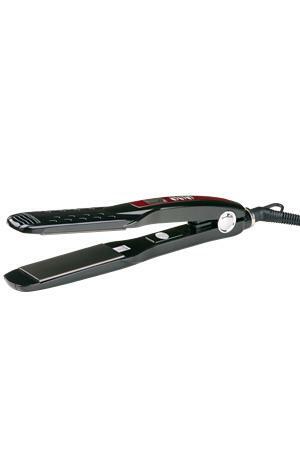 I have consistently had excellent results using the Barbar 2300 Professional 1” ½ Flat Iron and after four weeks of use there are no noticeable split ends or frizz etc. My hair is healthy and my stylist commented on my last visit that I only needed a slight trim as opposed to an actual cut because it was in such good condition. Barbar has the latest professional technology for hair care including blow dryers, flat irons, curling irons, treatments and accessories. I was very impressed to learn that Barbar even has an eco-friendly blow dryer, the ECO 8000 which uses a ceramic heating element instead of the traditional coil heating. What makes it eco-friendly? Did you know that in a coil heating system it “wastes electricity that it doesn’t use, thus turning it into radiation.” This was quite a shock to me and I would prefer not to be surrounded by radiation while blow drying my hair! You can learn more about all of the benefits of the Barbar ECO 8000 Ceramic Blow Dryer which retails for $150 by visiting the website or checking out this YouTube video. **You are not going to want to miss out on this fantastic savings offer for Simply Stacie readers. Valid until March 31st 2011, you can receive 50% off your order at Barbarhairtools.com! Use promo code Blog4fun on checkout. I would like to try the BARBAR Italy 3800 Ionic Charger Blow Dryer. I like Simply Stacie on Facebook. I like Barbar on Facebook. I would love to try the BARBAR Italy 3800 Ionic Charger Blow Dryer. I’d love to have the Barbar Italy 3800 Ionic Charger Blow Dryer. Woould love to try the Barbar Color Processing Steamer. Ahhh, the gift of time!